Weaving has been my passion and vocation since 1990. When I first learned to weave, I wondered why I hadn’t discovered it long before. In middle age, I finally knew what I wanted to be when I grew up. I guess that makes me a “late bloomer.” Now I’m in no hurry to “grow up,” as it might spoil the creativity. 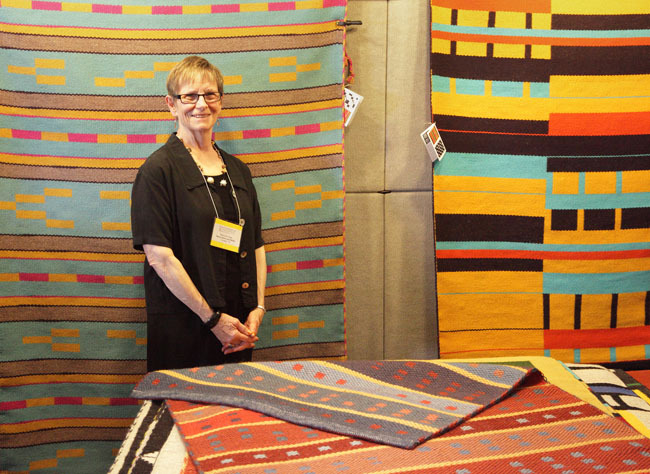 Rugs have been my primary focus from the beginning. Over the years, my style has evolved to the current contemporary designs you see here. I have been showing them at fine craft shows around the country since 1999. In addition to weaving professionally, I have taught weaving classes at The Ink People Center for the Arts weaving studio in Eureka, California, and also workshops at the Mendocino Art Center in Mendocino, California. In the fall of 1999 I spent a month-long artist in residency at the Mendocino Art Center. In August of 2007 I returned to Eureka, California, after living in Minnesota for four years.